Source: Received as seed from Turkey, via W. Reuther, 1968. 3/23/1987, EMN: Six individual seedling budlines fruited at Lindcove; all appeared identical. 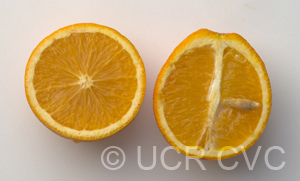 W. Reuther says to call this "Crescent" orange when & if released. 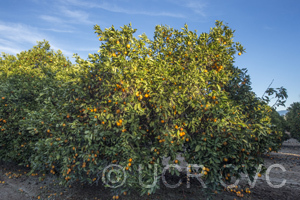 Early seedless orange, almost all fruit on ground. See original (old) cards in complete accession card file for details on origin, location in Turkey, etc. 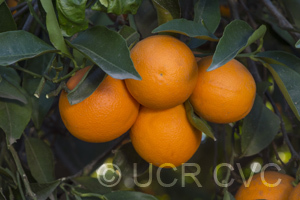 1/1989, EMN: Fruit from Lindcove evaluated and compared with navels. 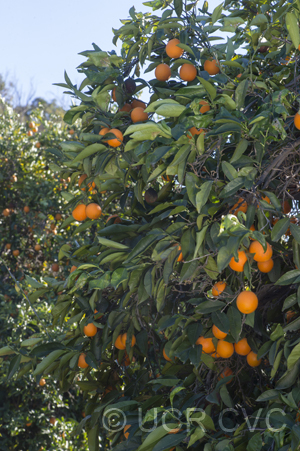 Fruit is smaller than navels, somewhat elongate & Minneola shaped, rind color considerable lighter than navel orange rind color. Flavor is good but not as good as navel in my opinion; fruit picked Dec. 14 was already 13.9 S/A ratio; navels were averaging about 10.5 to 11.5 S/A ratio. Despite earliness, small fruit size and poor shape, and poor rind color would rule it out as a navel competitor, I think. Might be good for early season juice; bitterness not checked.